Condensation is caused by water vapour within a building and results in problems when combined with poor ventilation. Common sources may include cooking, bathing, dishwashers, drying clothes on radiators etc., hence it is often referred to as a lifestyle condition. Moisture in the air (water vapour) comes in to contact with cold surfaces and condenses and can then lead to dampness causing mould growth and damp patches on walls. 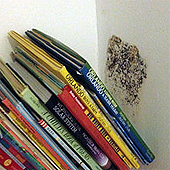 It can also occur inside cavity walls where it is known as interstitial condensation. Buildings with poorly insulated walls are very prone to this problem. It often causes damage similar to penetrating or rising damp in a building and often appears in similar places hence the frequent mis-diagnosis. In the United Kingdom, condensation problems are particularly common between October and March as this is the period when external walls are at their coldest and homeowners close up all windows and other would be sources of ventilation- to the extent that this period is often referred to as the "condensation season." In many cases a change of day to day activities can help reduce condensation, not drying clothes on radiators, using a drying area that is well ventilated, closing bathroom or kitchen doors when bathing or cooking (whilst providing adequate ventilation from these rooms to the outside) and just opening windows as much as possible to allow natural airflow through and around the property. The application of so-called 'anti-condensation paints', whilst helping reduce the more obvious signs of condensation e.g. mould, does not actually remove the dampness from the property. In cases where condensation is more severe alternative physical measures may be required. Homeshield recommend the installation of Passyfier Vents in to the walls of rooms where condensation occurs. 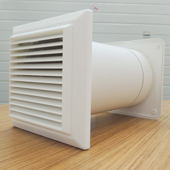 The vent comprises a telescopic sleeve that is fitted through the wall with louvres internally and an appropriate external cover and is filled with a mineral wool which prevents drafts but deals effectively with any moisture vapour which would otherwise cause condensation. Homeshield often retro-fit these to properties where airbricks were previously used and the vent well exceeds all the stipulations for background ventilation of habitable room as prescribed by current Building Regulations. Whilst passive ventilation is effective in preventing condensation in the majority of rooms in a home, where the production of water vapour (steam) over a short period of time is copious e.g. bathrooms or kitchens, we would always recommend the installation of mechanical, electrically driven extraction units. Following a Homeshield visit we will pinpoint any areas of concern and explain our recommendations to remedy the problems.